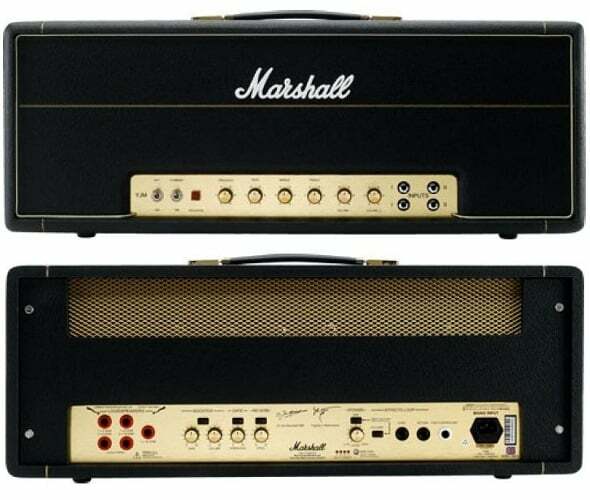 Gear Vault » Amplifiers » Front Page Gear » Bugera TRIREC – Mesa Boogie Rectifier Tone? Bugera TRIREC – Mesa Boogie Rectifier Tone? Valves can be mined for an enormous palette of tones, but most amps leave you with just a Master Volume dial and one choice of valves, making it all but impossible to experience these varieties at anything less than titanic volumes. Enter the BUGERA TRIREC—this all-valve tone buff et features a Varipower dial that scales output power from 1 to 100 Watts, giving you sweet power tube saturation at apartment-friendly volumes. Feel like experiencing a power valve variety besides 6L6? Just flick a switch and you’re ready to swap them for EL34 valves (not included). It also features three preamp channels, each with a wide array of sound options, internal reverb, a boost option, an FX loop, and three rectifier modes (valve, silicon diode, valve and silicon diode). Rectifiers convert alternating current (AC) to direct current (DC), giving your guitar amp the power it needs to rock. Most of today’s amps feature solid-state rectifiers, which have high power output and tight bass response. 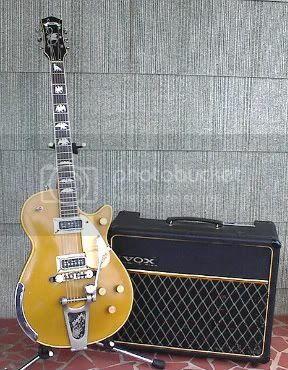 But many guitarists prefer valve-based rectifiers, which are known for their “sag” effect – this basically means when you slam a chord, it doesn’t reach its full volume right away, but instead makes a tough initial impact before quickly blossoming into a classic rock ultimatum. With the BUGERA TRIREC, both breeds of rectifier are alive and well in the same amp. You can even use them at the same time! Choose Silicon Diodes for high power and tight bass, Valves (2 x 5U4 valves) for lower power and the almighty “sag,” or a combination of the two called Valves & Diodes for medium-powered operation spiked with equal parts punch and vintage grace. Three is a recurring number when it comes to the awesome features of the TRIREC. There are three preamp channels, each with three-band EQ, Presence, Volume and Gain controls. Channel 1 gives you pristine cleans and a DRIVE setting for a dynamic crunch tone. Channels 2 and 3 give you three overdrive modes: Classic for blues and classic rock sounds, Vintage for more gain for hard rock, and Modern for pure, maniacal metal. Five 12AX7 valves give the TRIREC’s preamp stage the mojo to cover this vast tonal palette. The output stage contains 4 x 6L6 valves (convertible to 4 x EL34 valves—not included). The Varipower dial allows you to determine the power amp section’s output power continuously from 100 W to 1 W. This gives you the compression and sustain of saturated power valves that can otherwise only be achieved by cranking your amp to Earth-shattering volume levels. There is also a Master Volume knob for controlling overall output, a Boost knob for adjusting the amount of optional volume boost (via the adjoining Boost button or included FSB106A footswitch), and Reverb for adding a touch of beautiful digital hall simulation. The TRIREC’s incredible tonal variations make it a recording studio gem, but it’s got the features that make it equally amazing on stage. The back panel features a LINE OUT jack with dedicated Level knob for sending signal to a slave amp, as well as Loudspeaker jacks with switchable impedance (16, 8 or 4 Ohms), making this amplifier compatible with virtually any speaker cabinet. The built-in FX Loop has controls for adjusting the output (send) and return levels separately. The associated Assign knob has four states: FX loop is always on, has an individual status per channel, is activated via footswitch, or is deactivated. You also get six External Switching jacks that allow channel switching, BOOST, REVERB and FX LOOP to be controlled by an external switching system. This is where you’ll find the input for the FSB106A footswitch, which also controls these parameters, and offers a MIDI IN/THRU connection controlling the TRIREC in sync with your MIDI setup. “Heavy” is a relative term. The walls of amps at Woodstock? Heavy. The stacks used in modern metal? Colossally heavy. Yet neither flavor of heavy shows any signs of going out of style. This amp is loaded with brutal power, but it can also be tamed with unprecedented ease. Harness the power of valve-based rectifiers or silicon diodes in a single amp, or combine them for the best of yesterday and today with the TRIREC. Give your tone the power it deserves – plug into a TRIREC at your nearest BUGERA dealer. How much is it? Check for price. We can’t wait to get our hands on one of these for a full hands-on review! Bugera Magician – Mesa Boogie Mark Tone?